Hello Utah County! Do you want brighter, whiter teeth? Most Utah County folks notice their teeth dulling as the years go by, but some foods, drinks, and even mouthwashes can stain teeth at any age. Over-the-counter tooth whitening products like kits, strips, or toothpastes may slightly lighten stains, but for a truly brilliant smile, Dr. Hammond can help! If you have dental veneers, bonding, or bridges, teeth whitening bleach will not lighten the stains and your whitened natural teeth will make your dental work look even duller in comparison. 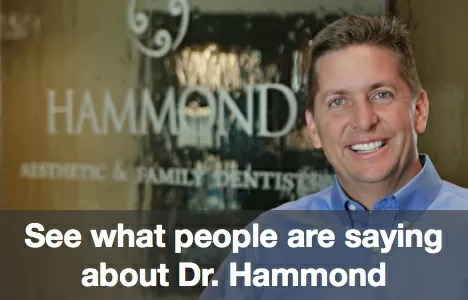 At Hammond Aesthetic & General Dentistry, we can recommend new cosmetic dental work, including veneers or bondings, if these have aged and discolored. Utah County in-office Zoom whitening takes about an hour and bleaches teeth to a whiter-than-ever brilliance. Take-home professional teeth whitening kits are also available at Hammond Aesthetic & General Dentistry and can produce the best results over time.